Driver and vehicle fitness are important requirements for road users to share the roads safely. Vehicle owners should be enabled to make informed decisions on the roads daily, not only with regards to safely driving their vehicles but also on how to acquire, finance and insure those vehicles! Decisions around vehicle asset finance might appear as a challenge/ threat for many road users. We decided to assist prospective and existing vehicle owners by approaching the experts on vehicle asset finance from Standard Bank and raise questions that may help us to better understand vehicle asset finance. 1. What is vehicle finance? Vehicle finance is an agreement between a bank and a customer which enables the person to take delivery of a car and then pay the bank back for the vehicle over an agreed period of time. The terms of this arrangement can extend up to six years. At Standard Bank, we partner with our customers by providing financial solutions to them. We finance the initial purchase price of the vehicle. This makes it easier for our customers to buy a car and in some instances we require no deposit from them. This is assessed on a case-by-case basis. 2. Isn’t it easier to apply for a personal loan and then use the money to buy a vehicle? As a responsible partner to our valued customers, we always help to make sure that we explain to them that a personal loan can be more expensive than a traditional car finance loan. This is because a personal loan is given to a customer without him or her having to provide security for the loan. This also means that a higher interest rate may be charged on a personal loan. As such, we would not recommend that one of our customers apply for a personal loan in this instance. A vehicle finance loan is backed by a moveable asset which is purchased, and the interest that the consumer has to pay, is often lower. Because of the price of vehicles, it is also unlikely that a personal loan will cover the costs of a new vehicle. Standard Bank also offers financial solutions based on the credit record of an individual customer. This means that customers with good credit records can get vehicle finance at rates that are generally lower than the interest rate payable on a personal loan. Further to this, we will look at the sales price of the car that the customer wants to purchase. If the price is higher than the ruling market price, we will advise the customer against paying this and to look for a similar vehicle with a purchase price that is more in line with the market price. If a car is bought with a personal loan, the customer could end up paying more than what the car is worth on the market. 3. What are the biggest misperceptions that people have about vehicle finance? People believe that different banks have vastly different offerings when it comes to car finance. This is not the case, what makes one bank different to the other is how easy it is to do business with. 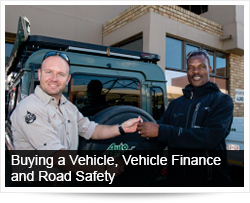 At Standard Bank, we are happy to explore tailor-made financial solutions with prospective vehicle buyers. 4. When does actual ownership of the vehicle change? This can depend on the type of agreement signed when the customer purchases the vehicle. However, ownership usually changes when the vehicle finance loan is fully repaid. 5. How can a vehicle finance provider differentiate itself from another apart from the financing rates provided – what does the potential buyer need to consider to make a fair comparison between providers of vehicle finance? All vehicle finance houses have to comply with legal requirements. In our commitment to assist customers wishing to purchase a new vehicle it is our approach to help draw up the necessary documentation to make this process as seamless as possible. The vehicle finance products are the same across the finance houses, however the differentiation is in the ease of doing business and the technology used to fulfil. 6. Is it a pure financial calculation or is vehicle finance a flexible process with scope for negotiation with a consultant from the vehicle finance company? We look at each application on an individual basis. The rates we offer will depend on the customer’s credit record, risk profile and repayment history on previous loans We therefore have a very flexible approach and we place emphasis on our customers’ needs and how we as a financier are able to assist. 7. What are the benefits and risks of applying online for finance as compared to via a consultant? The Standard Bank online process allows our customers to do a self-assessment and calculate what the financial costs of a loan could be. Technology enables our customers to do this at any time of the day or night at their convenience. However, due to the nature of car finance, the point is reached where original paperwork and agreements need to be signed. As part of our service to the customer, our consultants are available to help with this process. 8. What is bank policy regarding the age of cars that can be financed? Generally, banks do not finance vehicles that are 10 years old or older. The exception to this rule is vintage and classic vehicles. It is our policy to consider all our customers’ requests and consider providing financial solutions to them on merit. 9. If I wish to purchase a vehicle, which documents/ documentation would I need to provide to the bank/ vehicle finance company? If the customer banks with Standard Bank, the only documentation required will be an invoice, ID document, driver’s license and proof of insurance. The additional documentation for a customer who banks with a different institution would be to provide a copy of two months of bank statements or payslips. 10. Do I need insurance before I can get my car? Is this included in the product/ contract or up to me to ensure vehicle cover? Comprehensive insurance is required for all vehicles that we finance. Customers can arrange for their own insurance cover through their supplier of choice, or as part of our value-added offering. Standard Bank can provide this service, which is part of our comprehensive financial solutions package. 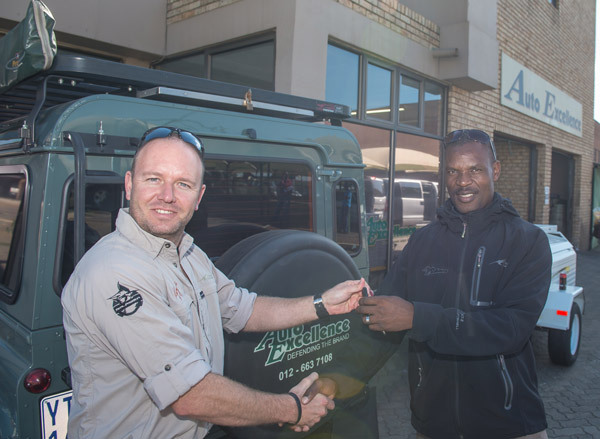 Proof and documentation that the vehicle is fully insured, must be provided by the customer to Standard Bank Vehicle and Asset Finance before the vehicle owner can take delivery of the vehicle. 11. What is the initiation cost of the vehicle finance loan? Does there need to be such a fee, or can it be distributed across the monthly financing costs? The standard initiation fee for us to finance a vehicle loan is R1 140. As part of the financial solutions that we offer to customers, this fee can form part of the sales agreement or vehicle owners can pay for it upfront. 12. How long can a loan term be for? The maximum term is 72 months. 13. How is the interest rate calculated and what would be the difference between a monthly repayment on a fixed interest rate or flexible one? The interest rate we offer depends on the credit worthiness and risk profile of an individual customer, as well as the size of the loan required to purchase the vehicle. We assess this and then come to an agreement with the customer based on individual requirements. The repayments on a linked rate are adjusted according to the changes in the prime interest rate, while a fixed rate is a fixed instalment that is paid throughout the agreed term by the vehicle owner. Monthly repayments on a fixed rate are generally higher than those of a linked rate agreement as the risk of any rate change are borne by the lender. 14. If it is on a flexible rate agreement, what will the implications be on the monthly amount I pay if the interest rate goes up/down? If the interest rate goes up, the instalment payment will also increase. The advantage for a buyer who chooses a fixed rate is that he/she knows exactly what the payment will be for the duration of the contract. 15. Are interest rates negotiable if the deposit is bigger? Yes. Putting down a deposit can help the prospective vehicle buyer to negotiate a better interest rate. This is because the risk taken by the financier is reduced as the size of the loan is reduced. 16. If I finance a new vehicle and it is faulty, who do I approach? Can the car be returned, or will the bank assist me? In cases such as this, the primary point of contact is the dealership. We merely assist with the transaction between the customer and dealer. However, we extend our assistance where discussions with a dealer are unsuccessful. If the matter is not resolved, the customer will need to involve the motoring ombudsman. 17. If, for some reason, I can’t afford the monthly payment – what are my options? Can I skip one month to catch up the next? We are always on hand to assist our customers and offer them the best advice where possible. It is best to approach us first so that we can assess your problem and assist where we can. We will explore all options open and come up with a plan that best suits our customers. 18. What advice can you offer to people who might be retrenched or dismissed? It is always advisable to consider insuring against these risks when financing a car. Again we advise our customers to ask us for assistance. We will always do what we can to assist and devise new repayment plans. Solutions could include rescheduling payments at a lower monthly cost, or providing our customers with a ‘breathing space’ on payments. In the worst case, we would advise our customer to sell the car. We believe in finding a solution for our customers where this is possible, but need to be consulted as quickly as possible when our customers have problems paying their monthly repayment. 19. Does the buyer have any additional obligations at the end of the financing term – would there be any additional money payable at the end of a loan? This depends on what contract terms were agreed to when the sales agreement was signed. For instance, a contract could call for payment of a balloon payment. This is a lump sum payment at the end of the contract, which would have to be settled before ownership can be passed on to the customer. 20. What must I do when I want to sell the car before it is paid off? You will need to ensure that the full amount owed will be covered by the selling price. Where there is a shortfall, this must be paid in before the vehicle registration papers are released. 21. Can I pay the settlement amount before the end of the agreed loan period, and would I be able to do so without paying a penalty? What is the new consumer Act policy on penalties? How can one prevent penalties being charged? A vehicle loan account can be settled at any time during the agreed period. The National Credit ACT (NCA) prescribes that a vehicle with a settlement value of below R250 000 pays a R0 settlement penalty, while a customer with a settlement value greater than R250 000 will pay up to a 90 days penalty. Settlement letters are valid for 7 days from the date of the settlement quotation. 22. Is it possible to gain access to info on your vehicle loan/ financing online? 23. When purchasing a vehicle from a private seller, what steps must I take to do so safely and where can I get finance? You must ensure that the vehicle actually exists. Ensure the vehicle belongs to the seller or that the seller is authorised to sell the vehicle. Ensure that the vehicle is roadworthy and assess whether it was involved an accident or not. Ensure that the vehicle documents are in order and that the documents required to register the vehicle are available. As part of our service to provide our customers with the best financial solutions, we do provide finance for private deals. It is important to note though that this adds conditions to these types of sales to safeguard customers and the vehicle finance provider. The sale process will be slower, but this ensures that our customers’ interests are safeguarded.